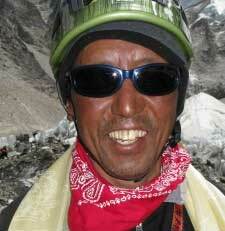 Apa Sherpa is the only man in history to reach the top of the world ( Everest) 21 times. As the world record holder of the most summits of Everest, Apa is widely recognized to be one of the greatest living mountaineers. Since that memorable day, Apa has participated in 21 Everest expeditions and reached the summit 20 times. Adhering to a simple philosophy that “Everest will always be there” and it is more important to keep all team members and sherpas safe, Apa has led his teams to amazing success. He is the recipient of three medals of commendation from the royal family of Nepal as well as being recognized by mountaineering associations around the world. It is this desire for his children’s education that has brought Apa to the United States. While the decision to leave his homeland was a difficult one, Apa knows that his new home will bring him continued opportunities to pass on all that he has learned from climbing. · Recipient of three medals of commendation from the royal family of Nepal as well as being recognized by mountaineering associations around the world. · September 2009 Apa Sherpa Citizen of the month Nevada, Las Vegas NV. · Draper Utah 2010 Grand Marshall for the city and parade. · 2008-2009- 2010 Eco Everest Expedition Team Leader. 2009 Eco Everest team cleaned off 13,000 lbs of garbage off of Everest in 2009 with the help of all the Sherpas and clean up sponsors. · 2010 Suunto Professional Athlete 2010, Summit banner sponsor, product testing, reviews. Highlighted in 2010 Suunto catalog, Web-site marketing Apa wearing product. T-6 Heart monitors watch testing on Mt Everest.